If you enjoy growing impatiens you’re in good company. These cheerful-looking annuals are the most popular bedding plants in the world. These attractive shade annuals got their botanical name because their seed pods explode when they ripen, shooting their sticky seeds far and wide. Perhaps these annuals are impatient to reproduce. Impatiens are popular because they’re easy-to-grow and flower in shade all season. Today’s cultivars are more tolerant of sun than many older varieties, but too much sun will stunt their growth, resulting in shorter plants with smaller leaves and not as many flowers. 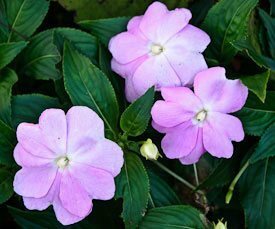 Available in many colors – red, scarlet, pink, white, rose and mauve – and in star patterns and bicolors with light colors inside the flowers and darker colors at the margins of the petals, impatiens comes in single, semi double or fully double flower forms. For sunnier gardens, choose New Guinea or sunshine impatiens. You will find a good supply of impatiens at nurseries and garden centers in the spring. For best success, choose bushy-looking plants with leaves that are lush and green. If you like to plant many flats of impatiens, you can grow them from seed yourself. Impatiens grow about six to 24 inches tall, but their eventual height in your garden depends on moisture and nutrient levels, how far apart you plant them and how much sun they get. If you want your impatiens to grow taller, space them quite close together, about six inches apart. But if you want them to spread out more, plant them at least eight inches to one foot apart. Give your plants the best start possible by mixing compost or slow-release fertilizer into the soil at planting time and finish off by watering thoroughly. To keep them looking their best, water deeply once a week through the entire growing season, and fertilize regularly. Impatiens make great container or window box plants in filtered shade. If you’re growing them this way, plant them in a soil-less mix, not garden soil. Then water regularly and fertilize weekly.